If you’re a fond fan of cheap, budget friendly blush you’ll be happy to hear about Lottie London Blush Crush Powder Blusher which is under $6 bucks and pretty darn brilliant. And even better news is you don’t have to take scary trips to K-Mart to grab yourself a pot. Let’s take a peek at my review and swatches of Lottie London Blush Crush Powder Blusher. Lottie London is Ulta.com’s latest UK import with a range of makeup and beauty goodies that are all under $13 bucks. I mean the most expensive item in their collection is $12.49 but most of the line is around $6 to $7 bucks. Can’t beat that right? Of course, I was most drawn to Blush Crush Powder Blusher. Any guesses why? It gave off that Bourjois Paris Pot Blush feel even though it isn’t baked and we all know what a soft spot I have in my heart for Bourjois Paris. This little guy is available in six shade selections each of which is 0.24 oz in size and will set you back $6.49. The blush comes housed in an adorable round pot with a fairly generously sized mirror inside but no brush or sponge for application. The pot is just the right size to dip a brush in without being too small or awkward to do so. I picked up a single shade to try which is called Justin which is a soft medium coral. It’s a soft, satiny semi-matte formula that blends quite easily on my drier cheeks and leaves behind excellent color pay off. It’s quite customizable as you can go sheer with a lighter touch or get much more pigmented color pay off when using a heavier hand. They blush wears for a good seven hour period without fading and gives a very nice pop of color on my cheeks. For under $7 bucks what’s not to love? Lottie London Blush Crush Powder Blusher are a fun, budget friendly blush with a nice formula that blended easily and wore well. Lottie London Blush Crush Powder Blusher is available now at ulta.com. Thought I ordered one…these have the heartthrob names, right? It wasn’t in the order. Maybe I’ll try again. Lots were OOS and had great consumer reviews. Maybe the one I ordered went OOS, but they don’t tell you…or me, anyway. Same thing happened with a dryer/flat iron combo, but I got it instore. Depotting, not straightening. Now that you like it…. I was wondering if these were any good. Thanks for your review. The K-Mart in my town closed earlier this year. my pleasure! Doesn’t surprise me, k-mart appears doomed! I just got 2 of these. Nick which is pink and Justin. I am waiting for Zayn to come from ulta later this week. They are pretty and last a long time. 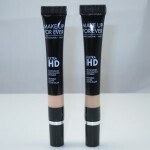 I bought the foundation stick — I’m REALLY loving it — $6. Just a nice light coverage in a stick form. LOVE LOVE LOVE. awesome! I need to try that next!